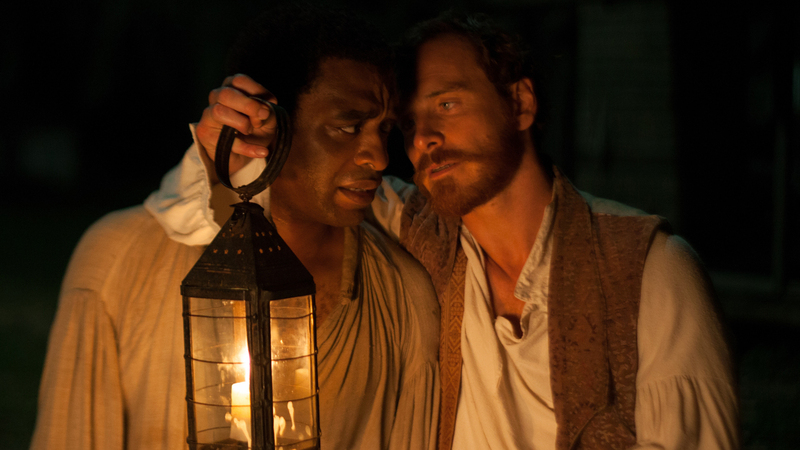 Chiwetel Ejiofor (left) plays Solomon Northup, a New York freeman kidnapped into slavery in 1841 and eventually resold to plantation owner Edwin Epps (Michael Fassbender). Just a few years before the start of the Civil War, two anti-slavery books became best-sellers in the United States. One was Uncle Tom's Cabin, the Harriet Beecher Stowe opus that went on to become the best-selling novel of the 19th century. The other was a memoir with a mouthful of a title: Twelve Years a Slave: Narrative of Solomon Northup, a citizen of New-York, kidnapped in Washington City in 1841, and rescued in 1853 from a cotton plantation near the Red River in Louisiana. Twelve Years a Slave — successful enough to prompt multiple editions before falling into obscurity after the war — was rediscovered by scholars in the 1960s and has now been transformed into a wrenching, soul-stirring film from British director Steve McQueen. The film begins with an enslaved Solomon Northup (Chiwetel Ejiofor) cutting sugar cane on a Louisiana plantation, then flashes back to the life he'd been leading just a few years earlier in Saratoga Springs, N.Y. There, he was a musician of stature, living with his wife and three kids in comfort and even some luxury. A free black family in a state that did not allow slavery, they inhabited a world of learning and culture. In fact it's Solomon's talent as a violinist that leads to his downfall. He accompanies two men to Washington for what he thinks is a fiddling job, only to have them get him drunk and betray him. New York has laws protecting its African-American residents. The nation's capital does not. He wakes up in chains. Patsy (Lupita Nyong'o), another of Epps' slaves, becomes the subject of her master's unwanted attentions — and the abuse of his jealous wife. Without papers to establish his identity, far from anyone who knows him, Solomon is helpless when his kidnappers rename him Platt and ship him off to Louisiana to be sold. As other desperate men in chains tell him, he'll be killed if he even says his real name, let alone tries to escape. Survival means "keeping your head down," he's told. "I don't want to survive," he gasps. "I want to live." Still, survival comes first. Sold to a Baptist preacher (Benedict Cumberbatch) who realizes there's more to him than meets the eye, and who treats him, as another slave puts it, like "prized livestock," Solomon does keep his head down. He bides his time, and urges others around him to do the same. Inwardly, though, he's seething. And when another slave accuses him of truckling to his master, he roars, "My back is thick with scars for protesting my freedom." McQueen keeps those scars — and the brutality that creates them — front and center in 12 Years a Slave, with incidents that scald, and searing supporting performances, particularly from Michael Fassbender (star of McQueen's previous art-house films Hunger and Shame) as a sadistic but strangely conflicted slave owner. But it is Ejiofor — bewildered, sorely tested, morally towering — whose staggered dignity anchors the film. John Ridley's script brings both historical sweep and an urgent intimacy to Northup's story — no small accomplishment. Rife with visceral beatings, multiple lynchings and an almost casual air of psychological cruelty, 12 Years a Slave is anything but easy to watch, but it is powerfully moving. It's also a powerful corrective, because it so skillfully links that brutality to the sort of tranquil antebellum South that Hollywood has often peddled — the broad porches, the hoop skirts, the fields fluffy with cotton. It will be hard for audiences to see those images ever again without thinking about the savagery and injustice that propped them up.